Search Results for "nice restaurant"
Three friends sitting in a cafe or a hub, chatting and smiling during the break, while guy typing sms waiting for the order. Young people relax in a nice cozy restaurant or cafe. Portrait young stylish attractive bearded guy in a white sweatshirt and typing on a laptop while sitting at a table by the window in a nice cozy restaurant or cafe. 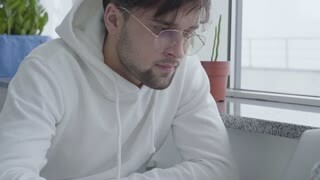 Portrait of a young stylish handsome bearded guy in a light sweatshirt and typing on a laptop while sitting at a table by the window in a nice cozy restaurant or cafe. Waiter serving salad to a young couple on a date. Interior of a nice restaurant. Couple dining together at the restaurant. Loving young man student is making marriage proposal to his beloved in nice restaurant, putting engagement ring on her finger and kissing hand, girl is happy and excited. Senior asian couple enjoy a glass of wine together in a nice restaurant. Mid shot favoring the man with other diners in the background. Mixed ethnic group raises wine glasses to toast each other in a nice restaurant. Big close up, moving from face to face. Smartly dressed African American and Asian diners socializing and enjoying each other's company in a nice restaurant. Big close ups, moving from face to face. Senior asian couple get their bill in a nice restaurant. Mid shot favoring the woman with other diners in the background. Family eating at a nice restaurant together. Chefs preparing food at a nice restaurant in Salt Lake City. Angry young man is fighting with his upset girlfriend during romantic date in nice restaurant. Guy is talking then throwing bunch of flowers and leaving. Handsome young man in fancy suit is making proposal to his beloved young woman during romantic date in nice restaurant and kissing her hand, girl is enjoying moment. Young couple in love sitting in nice restaurant. Man with beard and brown hair talking about himself. Girl in red dress listening attentively. Indoors. First date. Chef preparing food at a nice restaurant in Salt Lake City. Happy young people girl and guy are talking holding hands sitting at table with flowers, candles and champagne in nice restaurant. Dating and conversation concept. Senior asian couple meet up for a date in a nice restaurant. Man waiting alone could be on a blind date as he looks around before woman arrives. Server brings water as they sit down. Other diners in soft focus in the background. Mixed ethnic group of business people socializing and enjoying each other's company in a nice restaurant. Mid shot, moving from couple to couple.